In a way, this season can’t seem to hold a candle to the previous ones. The dynamics of the team in the first two season was awesome. Third season, while not awful, wasn’t the greatest either in that department, but Ryu Duk Hawn and Ahn Nae Sang were a pretty great combo and I did enjoy the season even if I didn’t like Jin Woo’s latest brain issue and the fake Dr. Phantom In Guk. This season brings back Jin Woo’s lady love, but all of the team are gone save Dr. Jo. Having Shi Woo’s and Tae Kyung’s flirtation actually isn’t all that interesting and doesn’t really add to the show. Each episode has it’s draggy points when gathered around discussing the case at certain times. But I do admit that the cases are really interesting and do expose some of the worst aspects of humans. How low can a person sink? How screwed up can a family and relationships be? Although, after Jin Woo’s problems flooding the first three seasons, it is interesting to have the main mystery revolving around Kyung Hee this time. I am more and more curious about the man who is stalking her and just what he wants. We open with a bloody, injured man trying to escape a locked room, but he dies instead. He is then found by a worker who is shocked to have a dead body fall out of the locked room. 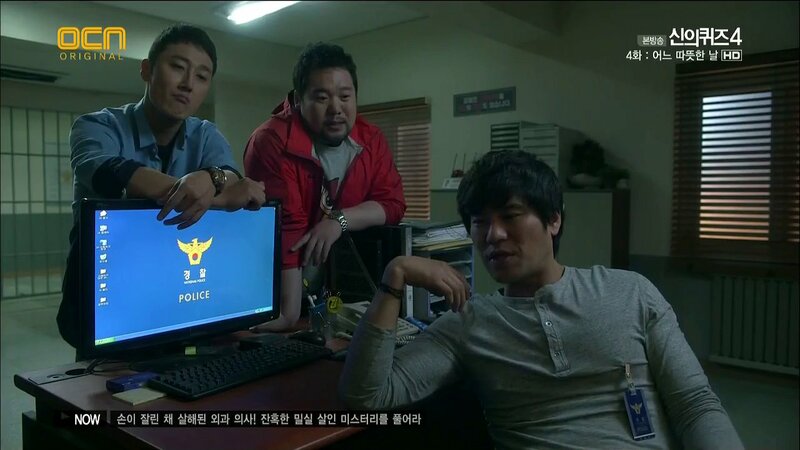 Meanwhile, the gang are celebrating Shi Woo’s arrival to their department. Jin Woo gets teased for being stingy and he has to say he bought five coffee’s to which Kyung Hee points out he got a free one with her coupon. He finally says he’ll pay for the get-together only to freak when Shi Woo orders a lot more food. Fine. He’ll pay for dinner and Dr. Jo can pay for karaoke later. Dr. Jo refuses. They should eat, drink, make merry and go home. What a party pooper. The next day…pointless flirtation between Tae Kyung and Shi Woo…I’m really not interested in seeing a couple story for our idol pair. Sorry. Love Donghae, though, lol. 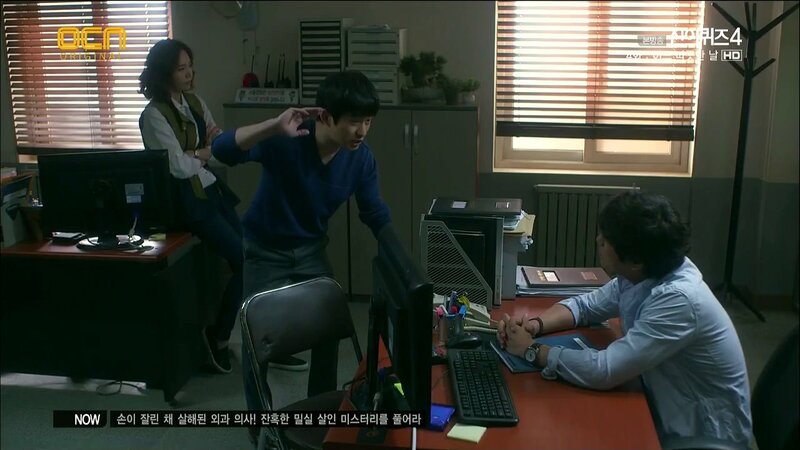 Anywho, Tae Kyung does warn him against peeping on her in the locker room again. We then cut to a breakdown of the case. A Dr. Hong is who was found dead. The case came to them because of the drug found in his system which turns out to be a drug not used in Korea any more due to it’s bad side effects. Other than that, the original autopsy showed no signs of any special disease. It does turn out that this doctor was kind of a like a mad scientist in a way. He would perform illegal surgeries. What kind? Arm transplants. These aren’t even done very often legally since the success rate is just too low. Jin Woo definitely takes a dislike to the dead doctor after hearing about his misdeeds and why his license to practice medicine was revoked. Kyung Hee, Doo Mong and crew go to the scene of the crime and while Doo Mong and men look around the inside, Kyung Hee is most interested in the fact that the lock is so low down and what’s more it is installed backwards. Meanwhile, the medical team talk about the transplant surgeries and given everything, it wouldn’t surprise them if one of the known experimentees killed the bad doctor. Kyung Hee and Jin Woo both think alike and end up at Dr. Hong’s funeral where they meet his 27-year-old son who is also an intern. Ki Hoon defends his father’s research, but not the method which leads to a heated argument with Jin Woo who doesn’t condone the experiments that were done. Ah, we do get a cute moment between Jin Woo and Kyung Hee where Jin Woo compliments their alike thinking and asks her to cross arms like they did in the old days. He is shocked when Kyung Hee complies without complaining. The detective team finds out that Dr. Hong has quite the fortune…besides money, he owns several buildings and all that is going to his only son. Meanwhile, Kyung Hee looks for the past victims of the failed surgeries. Of course, they all have alibis, as does the son. What next? Kyung Hee tries to organize all the information and just can’t. Jin Woo makes ramen and asks her again if she really doesn’t want any. Kyung Hee refuses and then finally gives up and tells Jin Woo to look through the paperwork and try to organize it for her. She then sits down and starts to eat his ramen. This upsets Jin Woo since he asked her time and again if she wanted ramen and if he should make a second pot which she refused. Their fight over food has the ramen she was eating fall back into the entire pot, so Jin Woo tells her to eat it all and just get fat. She promises to finish it when she gets a call from “oppa”! Meh. More of sleazy prosecutor. Of course, we all new in episode one that this unwanted suspicious man will come back in future episodes. Doesn’t mean I have to like it. Anywho, fancy pants prosecutor has a request. He wants Kyung Hee to look into somethign for him as he heard it was right up her ally. Kyung Hee goes to open the envelope, but he tells her to look at it later and take her time. Curious. Just what is he requesting she do exactly? Meanwhile, Jin Woo is trying to “organize” the case as he is famous for doing. Of course, he’s curious and slightly bitter I think about this man that Kyung Hee called “oppa” so easily. He then notices that all patients claimed that Dr. Hong would give back their surgery fees if the surgery failed. This means that it wasn’t for the money, but pure experimentation that Dr. Hong was performing these illegal surgeries with low success rates. He didn’t do the illegal surgeries for the money! He does meet with Kyung Hee and can’t help but ask what “prosecutor oppa” wanted. Kyung Hee tells him about the favor and that it is pesronal and Jin Woo is upset because she won’t tell and because the prosecutor oppa called her out so late at night for a personal favor. Anywho, he does tell her about Dr. Hong purely experimenting and Kyung Hee recalls Dr. Hong owned a derelict building. That would be the perfect place for his surgeries! 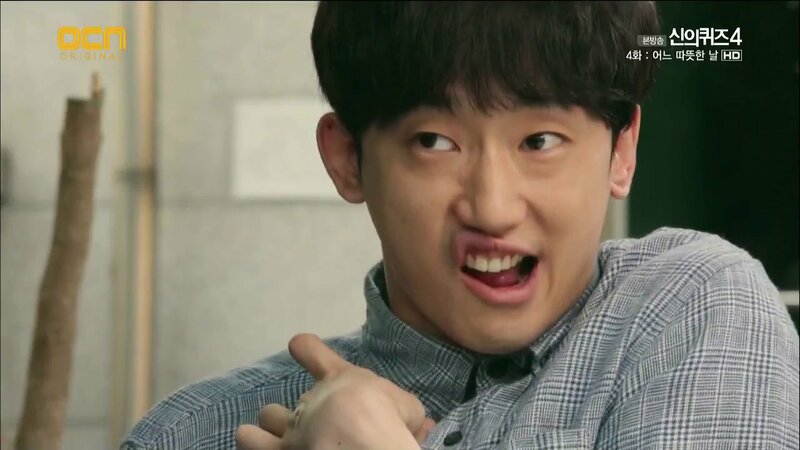 So…what did “prosecutor oppa” want? The team heads to the building and are tired searching the large place. Kyung Hee won’t give up and they finally hit gold and find a locked room. Inside is the operating table and all the records. The team finds something they did not expect among the records – a baby’s photo! Dr. Hong not only performed countless illegal operations as experiments and continued on with his research after his license was lost to vindicate himself, but he did the worst thing ever and experimented on a tiny little baby! He amputated the baby’s arm. Tear. Horrible. That was my expression, too. EVIL to experiment on a newborn baby. Kyung Hee goes over the evidence for the case before the meeting is called. 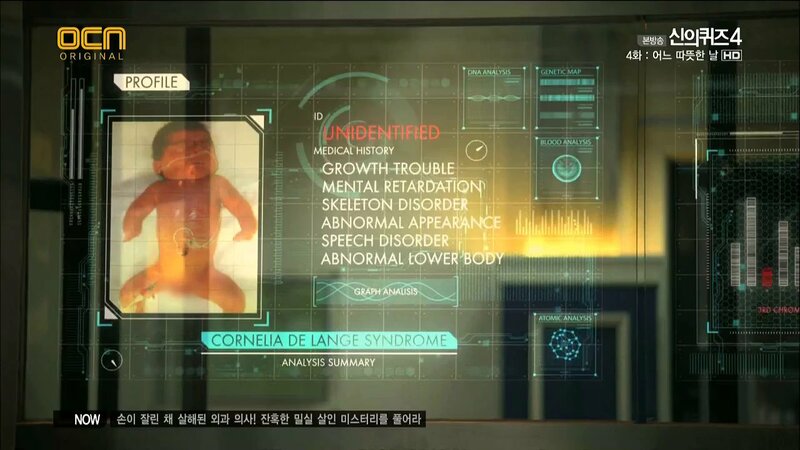 The medical team gather and Jin Woo says it is obvious the baby in the photo is suffering from Cornelia de Lange Syndrome which effects a child’s growth physically and mentally. This is a genetically inherited disease that was not known in Korea until the 1990s. The baby in the photo was born in 1988 making him 27. Given how severe the disease is, plus that the child is missing an arm, they just might be able to find the child and see if some relation of the child exacted revenge on the doctor by hurting him like the baby with the syndrome would be. Kyung Hee also thinks revenge is definitely correct. And some torture. Upon further examination, the lock’s passcode was the deceased doctor’s birthday. The killer tortured the man so he was hurt like the baby and then placed a lock at a low level for a false sense of hope that he could escape and get help. Inspection of the lock shows that while Dr. Hong had no strength in him thanks to the shot of the drug, he did press the combo with his tongue, which was too weak to register and thus he bled out and died. The team also find evidence from the secret lab that Dr. Hong did not do his evil deeds alone. The detectives pick up a woman at a sauna who was trying to administer some shot for beauty purposes illegally. She admits to being his nurse, but the team say they know she also worked in Dr. Hong’s secret lab. Oh Young Soo then says she never participated, but only readied the place for the procedures. They ask about the baby and Miss Oh says it was a baby from an adoption agency and she has no idea what happened to the child. It really is so obvious every time th woman lies, you know? Jin Woo then calls up Kyung Hee and says that they found the child Dr. Hong experimented on. He is in a home and in a wheelchair. I have to say major props to this actor as I think he did a really good job of portraying the disabled young man. Not sure who it is though. Anywho, the man’s name is Park Su Young. Dr. Han notices a scrape on his ankle. Su Young says he fell, but he’s fine. Kyung Hee then asks about the man’s family and friends. Su Young replies that because of his condition he has no friends and he cares nothing for the parents that threw him away. After talking with Su Young, Jin Woo and Kyung Hee go to leave, but Jin Woo stops and touches the floor. It’s smooth and shiny. There is no way falling on this floor would result in a scrape like on Su Young’s legs. Park Su Young 27 years after the EVIL Dr. Hong’s experiment. This guy is a great actor! After further investigation, it is learned that Miss Oh is a volunteer at the home where Su Young is. That is too much of a coincidence to be a coincidence, no? They then say that Miss Oh is Su Young’s mother. They have taken a DNA sample of both and are certain the results will be positive. They have CCTV footage of the two talking and Su Young repeating the word mother over and over again. Miss Oh breaks down and says she planned everything and it was all her fault. Her son was innocent. Su Young then comes in and says that it was all his idea. this leads to both parties being arrested. As Su Young is being wheeled away, Jin Woo asks why morphine was injected into the doctor. Of course it wasn’t morphine and since Su Young doesn’t know this, it’s proof he had no hand in the murder. Su Young is then taken to a facility where he recalls his mother’s (it actually is found out that the test results came back negative – Miss Oh isn’t his mother) tear stained face and tries to hang himself. He doesn’t die, but he will probably never wake up again. This is agonizing news to Miss Oh. Both Su Young and his “mother” try to take full responsibility for Dr. Hong’s murder. Of course, Doo Mong wants to write it off as the mother and son combo getting their revenge on Dr. Hong, but it just doesn’t add up. Miss Oh is a woman and too weak to plan and carry out everything herself and obviously Su Young would be no help. Jin Woo then gets an idea as he goes back to the secret lair of Dr. Hong and Hong Ki Hoon is called into the lab for some blood work. Ki Hoon does look a little worried about why they would want to use his blood for some routine tests. It’s not that simple! There has to be another person! So…if you thought last episode was pretty twisted, it has nothing on this episode. It turns out that Ki Hoon is NOT Dr. Hong’s biological son! He’s Miss Oh’s! And guess who Dr. Hong’s son really is? Su Young! He used his own baby as an experiment! He stole Miss Oh’s son and replaced it with the ill one and she agreed to the surgery only because she wanted the ill child to have full use of both arms…massive failure that. This new evidence strongly points to Ki Hoon as the culprit, but he has an airtight alibi. I’m not 100% certain of just what it is that Shi Woo says, but it is enough to cast doubt on Ki Hoon’s alibi, plus our detective who can understand our breathless detective when he eats and talks has an idea that Ki Hoon could have rented a car to throw of any suspicions and further backup his alibi since CCTVs show his car never left the parking lot during the time of the murder. When confronted, Ki Hoon is cocky and just asks for lawyer. That is until his mother comes over the speakers crying and telling him that poor Su Young will never wake up. This hits Ki Hoon like a rock to the stomach and tears start falling down. He then tells the whole sordid story. His father never treated him as a human being, but as his successor. Ki Hoon was to become a doctor and finish his father’s research and vindicate him. Ki Hoon was treated poorly and was taught that the human body was just meat. Su Young had it much worse, and what about his father stealing him from his birth mother? Dr. Hong just replied that he gave Ki Hoon a life he would never have had without him. I’m with Ki Hoon, Dr. Hong was a person who deserved to die. Ki Hoon planned everything himself, but he decided to get his “brother” Su Young involved. He wanted Su Young to have his revenge as well. Su Young was against this. Oh, he doesn’t have love for the man who is his father and experimented on him and made him even worse than he would have been, but the man is still his father, so how can he harm him? He does end up going with Ki Hoon, though. When Ki Hoon gives him the knife after cutting Dr. Hong’s Achilles tendons and smashing his hand several times with like a hammer or something, Su Young can’t go through with it. Doing it will mean they are as horrible as Dr. Hong. Ki Hoon yanks him out of his wheelchair and that how he got the scrape on his ankle. For a moment, Ki Hoon is still, but he recalls his father’s lecture about humans being meat and he can’t stop. He says his dad is right and stabs him viciously multiple times calling his father worthless rotten meat. Poor Su Young can only sob since he can’t stop Ki Hoon. Don’t stoop to father’s level! Miss Oh was completely unaware of all of this until Su Young told her. She should not have told Su Young to keep everything quiet and then things would not have turned out so bad, but she asked him as a favor as being his mother and Ki Hoon’s mother (she considered both children as her sons and loved them dearly just as both boys considered themselves more like brothers I think). Su Young had sobbed and pleaded with his mother as it was wrong. He knew that Ki Hoon did not take revenge for Miss Oh and Su Young, but only for himself. In order to keep his promise to Miss Oh, that is why Su Young decided to kill himself. Poor boy, it was the only thing he could think of to do to help. Jin Woo blames both Miss Oh and Dr. Hong for making such a horrible situation that hurt the boys like it did. Oh’s plea results in Su Young’s suicide attempt. Unfortunately, Su Young does not live. He passes away. Jin Woo watches on as Miss Oh cries in despair as he dies. Su Young’s and her wish as well as Ki Hoon’s was very simple and ordinary. To be together under a sky with a warm sun away from all the pain and sadness. This leads Jin Woo back to the hospital to see the precious Da Mi. He asks what makes her happy and she replies the usual stock answers about cartoons, etc. Da Mi then wonders what makes him happy. Jin Woo thinks about this and wonders and then Da Mi says he is happy he woke up, isn’t he? This really surprises Jin Woo. Da Mi…she’s a child, but dang she’s also like an adult. A very sad ending for Su Young. Da Mi shows a profundity in her cuetness and Kyung Hee is the target of Mr. Stalker! 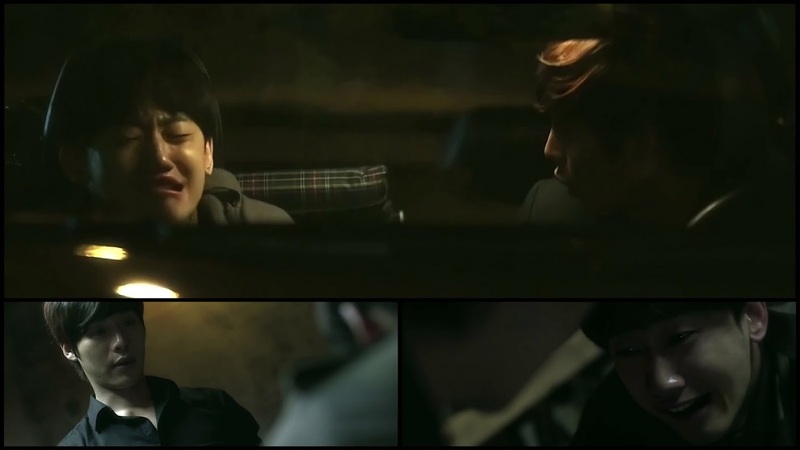 We end the episode with crazy stalker guy trying to take Kyung Hee out in a parking garage. I am surprised that our strong detective just stands like a deer in the headlights while the car speeds towards her. Oh, she doesn’t get hit, trust me. Previews show her fine and dandy. Are they going to start digging into the mystery surrounding her tattooed stalker? Can’t wait ’til Sunday to find out. Sad story but I must admit that this episode bored me silly! I think I looked away and did a HELL of a lot of work while watching this! Yeah, this episode wasn’t all that stellar. I think they could have done more with it than they did. There wasn’t much investigation wise and the plot just played out quite quickly…given it’s only a 45 minute episode any ways.